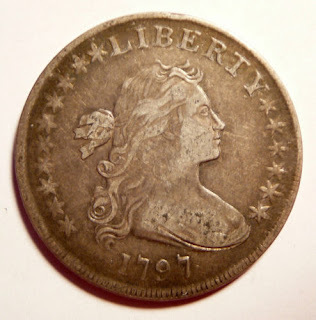 1797 Early American Silver Dollars. Mintage 7776. 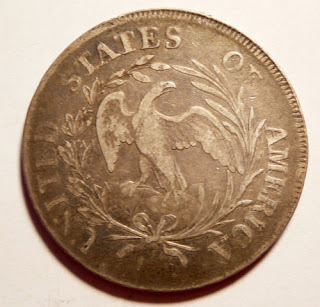 This has nothing to do with horology, other than these early American silver dollars were minted well over 200 years ago. My favorite early American dollar is the 1797. It has the small eagle on the reverse of the coin and the draped bust on the front of the coin. These to me are the best coins as only 7776 of them were ever minted, so being able to get one of these prized gems is very special. 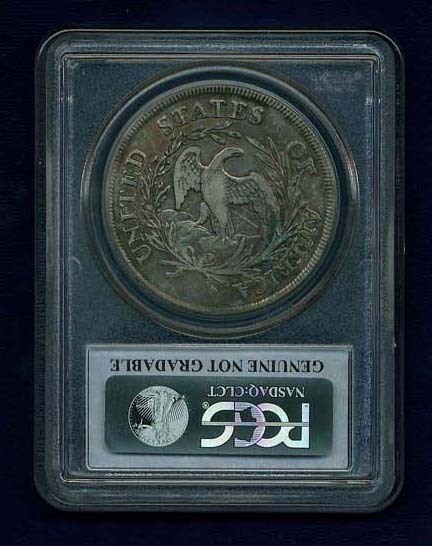 This coin was recently purchased for $1995.00. It has 9 by 7 stars on the front. 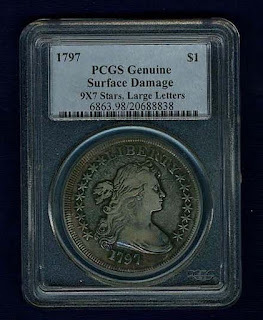 U.S. 1797 DRAPED BUST SILVER DOLLAR COIN, LARGE EAGLE PCGS CERTIFIED "GENUINE" - "SURFACE DAMAGE". 9 X 7 STARS, LARGE LETTERS, B-1a, BB-73, RARITY-3, BB DIE STATE III. A nice old circulated certified coin. 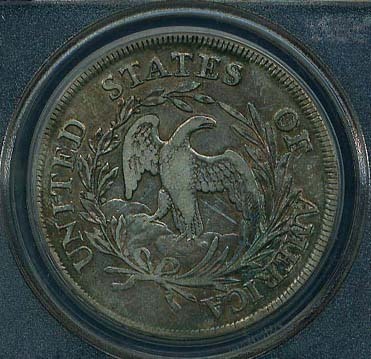 Some scratches above bust on obverse. 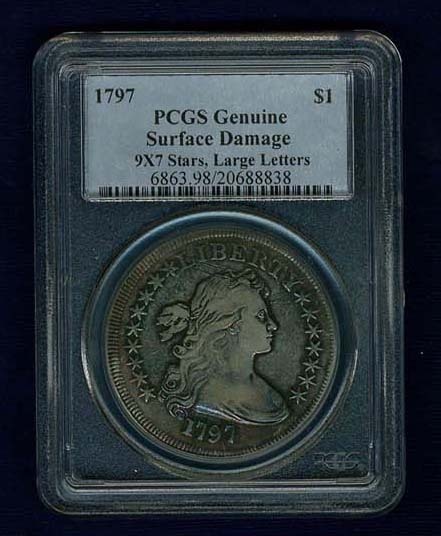 The 1797 silver dollars are listed in three different types. There is the 10 stars left with 6 to the right. Then you have the 9 stars to the left with 7 to the right. These coins have large letters on the reverse side of the coin which says United States of America. 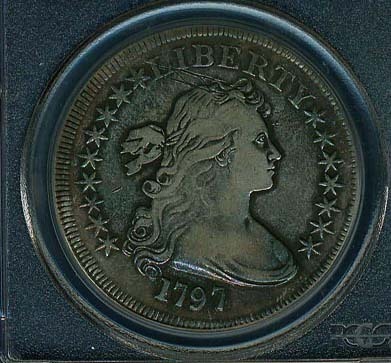 It seems that the most rare version of the 1797 early dollar is the one with the small lettering on the reverse side of the coin. The ones with the small lettering sells for much more than the ones with large lettering. The above 1797 just sold for $4551.00. You will notice that it has the 10 stars to the left and 6 stars to the right of the bust which probably accounts for the sale price. This is the reverse side of the 1797 dollar. Notice the wear on the eagle and the wings. Seems to have much more wear than the first coin shown. It seems again that the position of the stars on the front of the coin accounts for the dollar value. 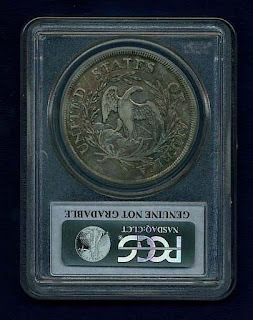 No matter what version of the 1797 early American silver dollar you have, they are a treasure and well worth the investment in obtaining one of these truly rare coins. These coins were designed by Robert Scot. The coins weight 26.96 grams. They contain .8924 Silver and .1076 Copper. The diameter of the coins is 39 to 40 MM. These coins are marked around the edge with the wording Hundred Cents One Dollar Or Unit. There is also some really weird markings or designs between the lettering. These are called decorations. Rolex 1601 With Mother of Pearl Diamond Dial and Bezel. These are pictures of a Rolex we just finished. A MOP dial with diamond markers and string diamonds was added. The watch also has a sapphire conversion crystal and a diamond bezel. Labels: Rolex 1602 MOP Diamond Dial. Rolex Mother of Pearl DateJust With String Diamonds. The Design number of the watch is 1601. The movement is a 1500 series. We took the original dial and added the MOP along with the diamond markers. We also added the string diamonds to the outside edge of the dial. The color of the dial changes depending upon the angle it is viewed from.